Chénier was born in Constantinople (Istanbul) to a French father who occupied the position of Consul and a mother of Franco Greek origin. He was taken, at an early age, to France, however, to live in Carcassonne whilst his father took the position of Consul General of France in Morocco. He later studied classics in Paris. After a brief period in the army, he returned to Paris and devoted himself to poetry particularly inspired by a Grand Tour of Italy and the vogue for neoclassicism. He was offered the position of secretary to the French ambassador to Britain which he filled without enthusiasm for the country from 1787 until 1790 returning to France shortly after the outbreak of the revolution. His works expressed sympathy for the royalist cause, however, placing him in danger of arrest. After a period of mainly nocturnal excursions when he took refuge in Versailles, he was arrested in error for the aristocrat being sought; and was imprisoned at the Luxembourg and later the prison, Saint-Lazare. In his last days of power, Robespierre sentenced Chenier to death on a charge of conspiracy and the sentence was fulfilled shortly thereafter. His poem, La Jeune Captive, was written during his imprisonment supposedly based on the thoughts of a fellow captive, the duchesse de Fleury. Chénier's works were largely unpublished during his lifetime but received belated and gradual publication in the decades following his death. They are noted for their blossoming of romantic sentiment blended within the classical genre current at the time. 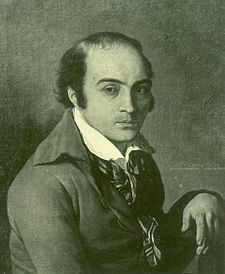 The poignancy of his unjust sentence has added to his poetic reputation but his works have inspired several later poets and musicians, particularly Pushkin, Kozlov and Giordano in his opera, Andrea Chénier.